Today is Day 2 of this week’s GORGEOUS Spring Home Tours! I’m sharing with you my Burst of Spring House Tour including my foyer and living room – I hope you’ll enjoy seeing my home decorated with springy colors and blooms! There are also 5 talented design bloggers opening their doors for spring today in blog hop style so pop by each one to get some new Spring time decor ideas!! If you’re coming from Simple Stylings then welcome!! I’m so glad you’re visiting with me today! Yesterday was the first day of Spring – although we still have LOADS of snow here! 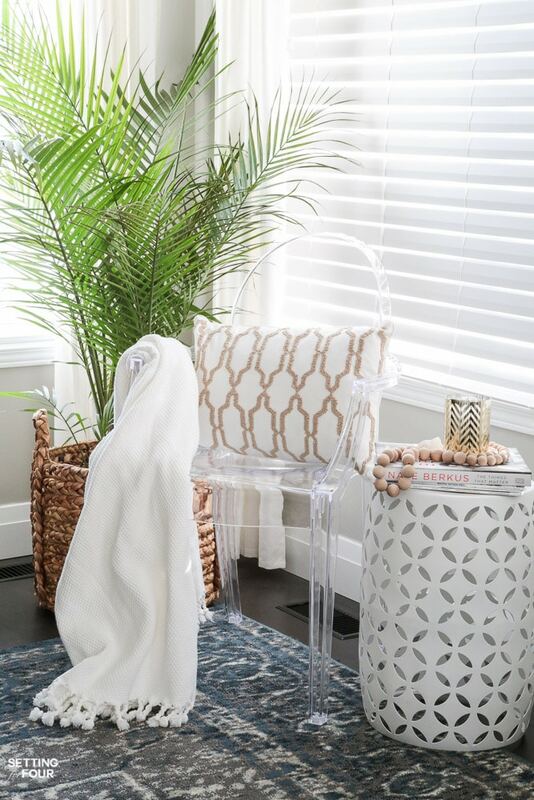 I’m completely over the snow and below freezing temps ….and ready to embrace Spring sunshine and a lighter look for our home! So I’ve packed away my winter faux fur throw blankets and pillows and added light spring colors, boxwood accents and white tulips throughout our rooms. Let’s start in my foyer! For Spring I added a dried boxwood wreath to my office door, some boxwood urns, moss balls, a vase of white tulips and pretty blush pink pillows to our tufted nailhead wingback chairs. I’m on the search for a settee for this space – but wow – settees are expensive!! These two beautiful linen tufted wingback chairs fit perfectly here though ….so until I find a settee at a good price they’ll stay because they are a perfect spot to sit down and slip my shoes on and off. I’ve tucked some white wicker baskets underneath them to store mitts in winter and flip flops in the summer. I’m a bit obsessed with garden stools – this one I picked up at Home Goods last year – they are perfect in a foyer beside a chair or bench and a fabulous place to set your keys, mail and phone. Here’s another shot of the blush pink pillows – they are so elegant and soft! They have a textured floral pattern that’s so chic and pretty! I’m really loving this shade of ‘rose quartz’ right now! This color looks amazing paired with neutrals, black and white. Let’s head into our living room! I picked up a palm tree recently – I really needed some life and greenery after the brutal winter we’ve had this year! I tucked it into a seagrass basket I already had – I love the pop of color and texture the fronds bring to our neutral living room. This is one of my tips on how to design a living room: adding greenery is so important to add interest and color! Here’s another garden stool!!! I stacked some design books on top with wooden beads with a gold chevron candle. I added a ghost chair to keep the room light and bright. 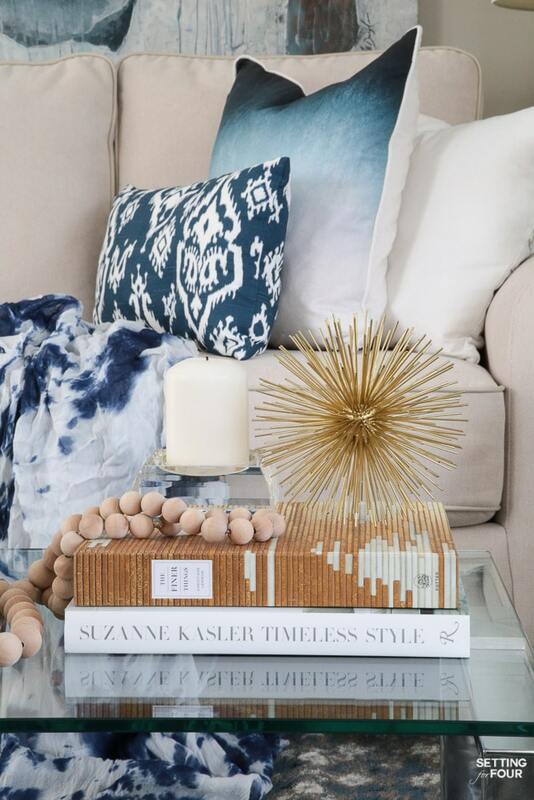 I put away my cable knit and faux fur pillows and replaced them with my blue dip dyed and ikat accent pillows – I love, love, love these relaxing colors of indigo and watery blue! I also put away my wintery coffee table accents – my white antlers and birchbark candles -and replaced them with touches of gold and crystal. I added a large crystal votive holder with a white candle, a string of natural wood beads and a gold sea urchin on a stack of coffee table books. I love using reflective and metallic decor in my home! These are two of my favorite design books: The Finer Things by Christiane Lemieux (who founded DwellStudio) and Suzanne Kasler Timeless Style. If you’re looking for beautiful coffee table books and design inspiration for two incredibly talented designers check these books out! 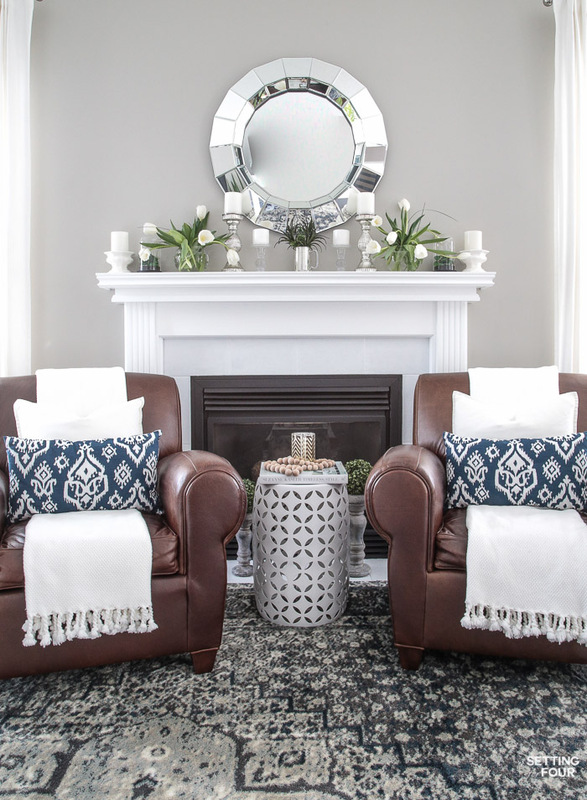 Our Pottery Barn leather club chairs got springified with some white pillows and throws and blue ikat pillows – to tie into the sofa seating area. Garden stools are a fabulous side table idea between two chairs and take up less space than an end table. I kept my mantel simple for Spring. two big bouquets of white tulips and white candles keep things ‘clean looking’ and bright! Here’s a closeup of my mantel! I love using clear round vases for my tulips. The round shape mimics the curves of the tulip petals. These tulips have the prettiest scent and I love their spikey green leaves! I tucked in some faux air plants into hubby’s pewter military mug for another pop of green. Air plants are becoming my latest obsession too…..!! I hope you enjoyed my burst of Spring House Tour today? Did you get some new ideas for your home? I hope so!! Now grab a cup of coffee and pop on over to The Chronicles of Home to see Jennifer’s stunning Spring Home Tour! 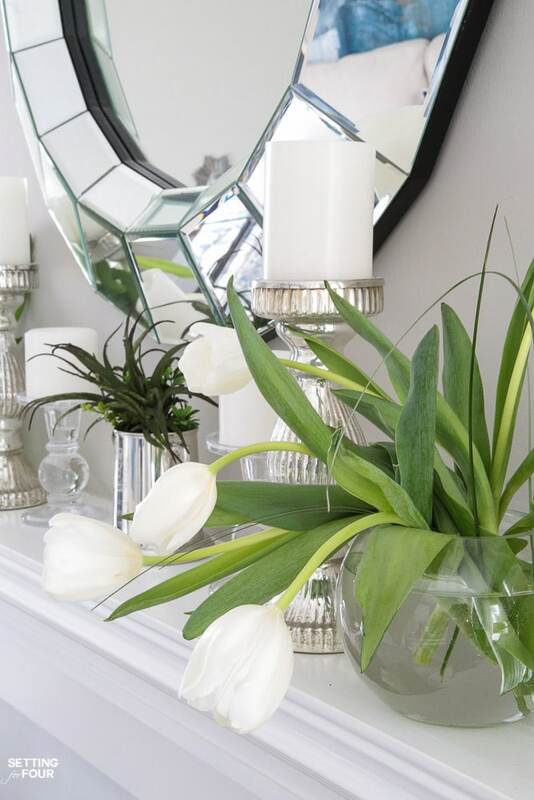 Great spring touches and your simple mantle! So pretty Heather. I’m loving all the blues. Those ombre pillows are everything. It’s a beautiful spring tour. What a lovely spring welcome. I adore the blush pillows and the garden stool was a fantastic find. 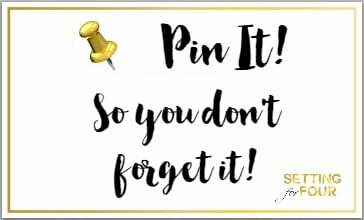 Your beautiful home is sparkling for spring and is motivating me to add some of these ideas to mine! Thank you. I love your living room and that blue ikat fabric on your couch??? Oh wow! Love love love that especially! The house looks beautiful. So glad to see that blue is still in trends. I love, LOVE your living room! 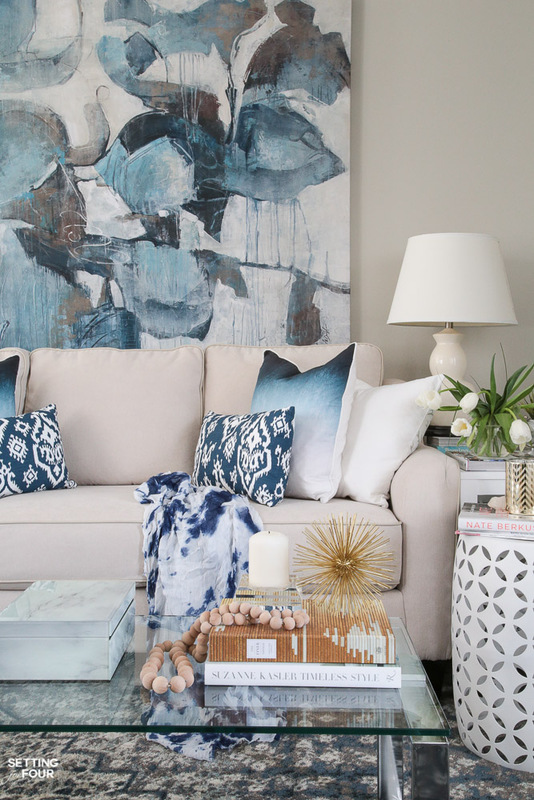 That big art piece, the pillows, the rug… Gorgeous home tour, it really is a Burst of Spring! Lovely Heather! That watery blue painting is gorgeous! And who can resist white tulips everywhere! LOVE! As usual everything is absolutely gorgeous. I adore those chairs and that garden stool in the entry, so beautiful and the pretty blues in the living room are stunning. So perfect for spring. Thanks so much for joining the tour, everything is beautiful. I love the small mirrors. Where did they come from? Everything is beautiful. I have a tutorial coming up for those mirrors Angela – stay tuned!! 🙂 Thank you for your compliments! Your mantle decor is beautiful! Hi Heather- your home is always so chic and stylish! I hope the snow has stopped and you can really begin to enjoy Spring. 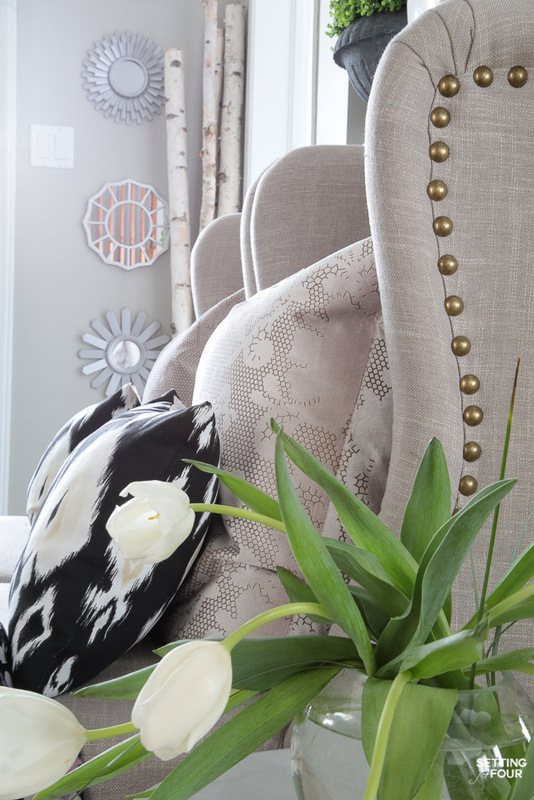 I love how you layered your pillows in the foyer Heather and all the spring touches in your home is just the right dose for the season – not too much and not too little either! Love it! 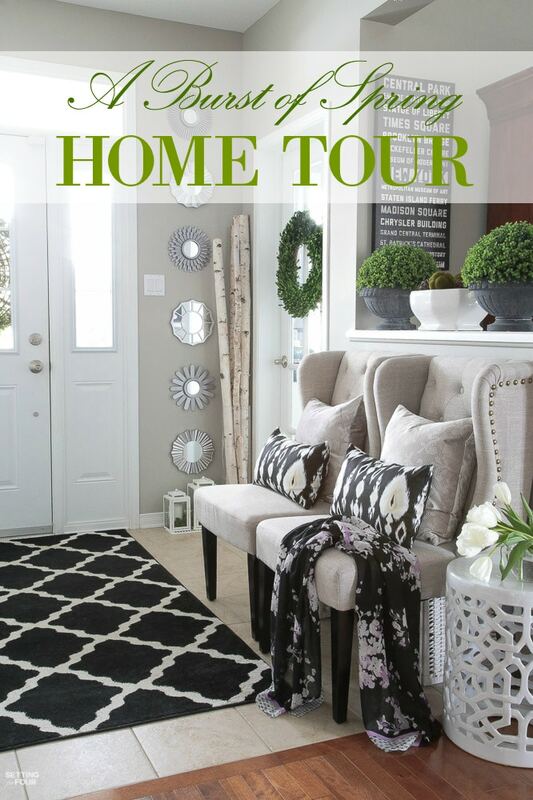 Honored to share this home tour with you! I love the blue and white in the living room and I really like the artwork behind your sofa.